If you already have 4 or 6 weeks' free Petplan insurance it's easy to activate your *continuous cover right here in a few simple steps. Just enter your policy number and state below, and we'll bring up your policy details and you can activate your full year cover in a matter of minutes. We have a choice of cover available, including our 12 month plan and our most popular Covered For Life® options. *provided that the full policy is taken up prior to the free policy expiration date. First we need to know some information about your free policy then we will show you what products and pricing is available for you and your pet. To quickly and easily convert your free four/six weeks free policy please fill in your final details below. First we need to know some information about your free policy than will show you what products and pricing is available for you and your pet. Include optional extra Death Cover & Loss by Theft or Straying benefit? Due to age restriction, you can not select ultimate, classic 2 and classic 1. Want more info about our policies? Prefer us to Contact you over the phone? Requesting a call from Petplans trained sales representitive will give you the information you need to choose the right plan for your companion. Thank You for submitting your interest. We will call you soon as per your preferred time and date. We have received your request and our friendly staff will contact you soon! 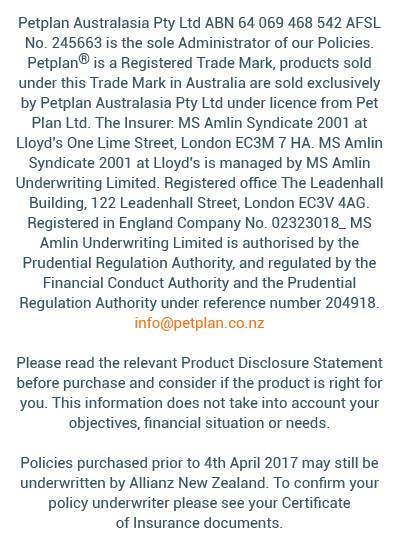 To proceed for cover for your pet, please fill in your further details below. Did you know we offer Equine Insurance? To get cover for your Pet, Petplan ask underwriting questions at the “proceed for cover” section instead of when making a claim. Have you made a claim or any incident that may give rise to a claim under a similar insurance policy in the last five (5) Years? Has any insurer declined or refused renewal or required special premium or imposed any exclusions on a similar insurance policy? Has the Pet proposed for insurance suffered any injury, illness or disease, been operated on, been on any course of medication or received any Veterinary attention? Has the pet proposed for Insurance bitten attacked or shown any aggressive tendencies? Do you authorize any treating veterinarian to supply Petplan with your Pet’s complete veterinary history, details of any claims, and any other relevant information? Do you have any other pets which are not insured with Petplan? Will the pet be used in any way within a business, trade or occupation? Are you converting from Petplan free policy? Do you understand your Duty of Disclosure requirements and the implications of non-disclosure? You must answer all of the questions truthfully and accurately. Please be aware that if You have answered YES to any of the above questions, We may vary the cover, apply exclusions to Your Policy, or decline to cover your Pet entirely. This will be determined after an underwriting assessment. Please confirm that you understand this declaration. Yes – I would like my Policy Documents & Product Disclosure Statements (PDS) emailed to me. To finalise your cover for your Pet, please fill in your final details below. Payment Transaction was not successful. Please try again..!! I have read and agreed to Direct Debit Client Agreement Please read and agree to Direct Debit Agreement Document ! !